Not to be confused with the University of Seoul. Seoul National University (SNU) is a national research university in Seoul, South Korea, founded in 1946. SNU, the first national university in South Korea, served as a model for the many national and public universities in the country. Through its 60-year history, SNU has grown to the level of most competitive, belonging to the Korean equivalent of the Ivy League colleges in the United States, the SKY universities with Korea University and Yonsei University. SNU embraces sixteen colleges and six professional schools, with a student population of approximately 30,000. SNU maintains two campuses in Seoul, the main campus in Gwanak, and the medical campus (named Yeongeon Campus after its neighborhood) in Jongno. SNU, notable for its "fleet-style" system, offers diplomas in a multitude of academic fields, from the liberal arts to nursing. Seoul National University's history presents a cross-section view of Korea's history since the end of World War II. Korea had no national universities at the beginning of the twentieth century. Education had been focused on preparing yangban to the Gwageo or national civil service examination. Yangban enjoyed the opportunity to prepare for the examination, which focused on the Confucian classics, in village schools. Japan sponsored the establishment of national universities during the occupation of Korea, opening the era of college education for all Koreans. Students still have to study outside the public K-12 system in hakwans to score high enough for admission to Seoul National University. The establishment of Seoul National University, and the running of the university by the South Korean government, marked a major mile stone in the development of higher education in South Korea. Note: The word 首尔大学 is frequently used in many Chinese context, as in Chinese Wikipedia. This is, however, not hanja name, because Chinese characters used in the word do not represent Korean sound of the word, but Chinese one. Thus it is only Chinese name. Other names as 汉城国立大学 have been used historically. Seoul National University, founded on August 22, 1946, merged ten institutions of higher education around the Seoul area, pursuant to "The Law Concerning the Foundation of Seoul National University." The schools merged included: Kyŏngsŏng University, Kyŏngsŏng Colleges of Law, Industrial Engineering, Mining, Medicine, Economics, Dentistry, the Normal School, the Women's Normal School, and Suwon Agricultural College. Harry B. Ansted served as the first president. Students and professors initiated protest movements against the law of the US military government in Korea merging colleges for more than one and half years. Finally, the United States provisional government fired 320 professors while more than 4950 students left the school. Lee Chunho (이춘호; 李春昊) served as the university's second president beginning October 1947. The law department of Kyŏngsŏng University merged with Kyŏngsŏng Law College creating the college of law. The university absorbed Seoul College of Pharmacy, previously a private institution, in September, 1950, as the College of Pharmacy. During the Korean War, the university temporarily merged with other universities in South Korea, located in Busan. Originally, the main campus, embracing the College of Humanities and Sciences and College of Law, resided on Daehangno (University Street) in Jongno. Most parts of the university relocated to a new campus in Gwanak in the period between 1975 and 1979. The College of Medicine, the College of Dentistry and the College of Nursing still use part of the former main campus in Jongno, called Yeongeon Campus. In 1975 the main campus of the university moved to the newly constructed Gwanak Campus. 2006 marked the 60th anniversary of the university. Seoul National University has earned the reputation as one of the most competitive universities in South Korea. From 1981 to 1987, when an applicant could apply only to one university at a time, more than 80 percent of the top 0.5 percent scorers in the annual government-administered scholastic achievement test applied to SNU, many of them unsuccessfully. No comparable data exist for direct comparison between SNU and non-SNU applicants after 1988, due to an extensive change in South Korea's college entrance system. SNU graduates dominate South Korea's academics, government, politics and business. The concentration of SNU graduates in legal, official, and political circles stands particularly high. Two-thirds of South Korean judges have graduated from SNU, although the country's judicial appointment system remains based solely on open competitive examinations. In government, slightly more than half of South Korea's elite career foreign service corps, recruited on the basis of a competitive higher diplomatic service exam, graduated from SNU. Similarly, among the high-ranking government officials recruited by an equally competitive higher civil service exam, SNU graduates take up more than 40 percent. On the political side, four out of seven presidential candidates in 2002 graduated from SNU. Some South Koreans criticize the school for elitist and bureaucratic characteristics. 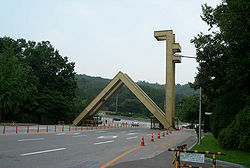 The main gate of of Seoul National University, known by its nickname, the Sha gate. Seoul National University maintains two Seoul-based campuses: the Gwanak Campus, situated in the neighborhood of Sillim-dong, Gwanak-gu; and the Yeongeon Campus, north of the Han River in Yeongeon-dong, Jongno-gu. The SNU Comprehensive Plan established the main campus in Gwanak-gu in 1975. At present, approximately 200 buildings, over half constructed since 1990, make up the campus. The school’s medical, dental and nursing schools, as well as the main branch of Seoul National University Hospital, situate on the former site of Kyungsung University’s medical department at the Yeongeon Campus. In 2003, the Colleges of Agricultural and Life Sciences and Veterinary Medicine relocated from Suwon to Gwanak. The main campus, Gwanak Campus, stands in the southern part of Seoul served by its own subway station on Line 2. Yeongeon Campus, the medical campus, sits on Daehangno (University Street), northeast Seoul. The defunct Suwon Campus, the agricultural campus, also known as the Sangnok Campus (Evergreen Campus), used to be located in Suwon, about 40 km south of Seoul. The agricultural campus moved to Gwanak in Autumn 2004, but some research facilities still remain in Suwon. In February 2010 Seoul National initiated a memorandum with the city of Siheung to establish a global campus. Signed with the city's mayor and governor of Gyeonggi for administrative assistance, the University acquired 826 thousand square-meters (204 acres) of property to secure influence in the west-coast economic zone, abut the Songdo International Business District, access Pyeongtaek harbor, gain better location to the international airport, seaport and other wide-area transportation catchments, and achieve shared growth with the city's industrial research parks. The land acquisition will increase the university's size by 58 percent over its current 1.4 million square-meters (350 acres) to 2.2 million square-meters (550 acres) and headcount by an expected 10,000 people or 33 percent of its current figure. Along with lecture halls and additional liberal arts and graduate courses, the initiative will add a medical complex including a research hospital and training center, research center for dentistry and clinical pharmacology, dormitories, apartments, an international middle and high school, and other facilities. Seoul National University Library is located behind the university administrative building in the 62nd block of the Gwanak Campus. On December 31, 2005, the library’s total collection of books, including all the annexes, numbered approximately 2.6 million volumes. The present chief librarian, Dr. Park Myeong-jin, professor of media and information in the College of Social Sciences, took office in 2006. The Central Library has constructed a digital library, which provides access to the regular library collection and to university publications, ancient texts, and theses, including a vast collection of images of pamphlets, lecture slides, and insects. The digital library also offers access to video of university exhibitions, scientific events, symposiums, and seminars. The library first opened in 1946 as the Seoul National University Central Library, inheriting its facilities and books from Kyungsung University. In 1949, the name of the library changed to the Seoul National University Library Annex. When the main branch of the library relocated to the Gwanak Campus in January of 1975, the university changed the name to Seoul National University Library, and then renamed again in 1992 the Seoul National University Central Library. In 1966, provisions the library systematized its collections, creating an annex for each of the university’s colleges: engineering, education, physics, art, law, theology, pharmacology, music, medicine, dentistry, administration, and agricultural sciences. Two years later, in 1968, the university added libraries for newspapers and the liberal arts to bring the total number of annexes to fourteen. When the main branch moved to the Gwanak Campus, the education, physics, legal, theological, administrative, newspaper, liberal arts, and pharmacological libraries combined in a single building. The following year the art and music libraries also combined in the main branch, while the dentistry and medical libraries amalgamated. With the integration of the engineering library into the main branch in 1979, only the agricultural and medical libraries remained as separate annexes. A new law library established in 1983 with funds from alumni, and in 1992 the Kyujanggak Royal Library subdivided from the main library as an independent organization, now named the Kyujanggak Institute for Korean Studies. With the transfer of the College of Agricultural Sciences from the Suwon to Gwanak Campus, the Agricultural Library also moved in 2005. As of 2006 seven remaining library annexes for management, the social sciences, agriculture, law, medicine, dentistry, and international studies reside on the campus. Seoul National University Museum, located at the Gwanak Campus, originally opened with the university in 1946 under the name "The Seoul National University Museum Annex." The original two-story Dongsoong-dong building, completed in 1941, had served as the Kyungsung Imperial University Museum until transferred to SNU. The museum moved to the sixth floor of the Central Library, in 1975, renamed as the Seoul National University Museum. The museum then moved to newly constructed facilities, next to the Dongwon Building, in 1993, its present location. Dr. Park Nak-gyu serves as the director as of 2007. Seoul National University Museum of Art established in 1995 with contributions from the Samsung Cultural Foundation, after a proposal from Dr. Lee Jong-sang, a professor of Oriental Art. 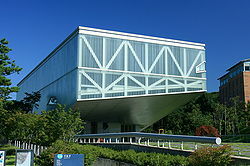 Design was by the Dutch architect, Rem Koolhaas, with construction entrusted to the Samsung Group. This 4450m² structure sits three stories above and below ground. Its major distinguishing feature is the forward area which almost appears to be floating in the air. Construction was undertaken from 2003 to 2005, just off the Gwanak Campus’ main gate while the opening took place on the June 8, 2006. Dr. Jung Hung-min assumed the directorship of the gallery in 2006. The first edition of the paper published while seeking refuge from the ravages of the Korean War, on February 4, 1952. In 1953 the office moved to Dongsoong-dong in Seoul, publishing editions for high schools as well from 1958. Financial difficulties in 1960 lead the paper to cease printing for a time. Relocating to the Gwanak Campus in 1975, the paper has been in continuous publication until the present day. At the time of its first launch the paper sold for 500 won a copy, sometimes twice a week. Now, the university distributes the paper for free every Monday. The school paper suspends publication during schools breaks or exams. Kang Kum-Sil: 55th Minister of Justice of the Republic of Korea (2003-2004) and potential candidate of the 2007 presidential election. Kim Young-sam: former president of South Korea (1993-1998). Kim wrote his B.A. thesis on Immanuel Kant. Ban Ki-moon: current Secretary-General of United Nations; former Minister of Foreign Affairs and Trade of South Korea. Yi Munyol, novelist and political commentator. He attended the College of Education but did not graduate. ↑ Website of Roman Law Study Group (in Korean). College of Law, Seoul National University. Retrieved July 28, 2007. ↑ History of the College of Pharmacy. SNU College of Pharmacy website. Retrieved July 24, 2005. ↑ Yea-rim Kim, Siheung is on the Road to Becoming Korea's Investment Mecca Korea Times (March 16, 2011). Retrieved October 26, 2012. ↑ Young-jin Chung, Plans under way for new SNU branch in Siheung Korea JoongAng Daily (February 12,2010). Retrieved October 26, 2012. ↑ Shin, Eunju (申銀珠). "ソウルの異邦人、その周辺一李良枝「由煕」をめぐって (Portrait of a Foreigner's World in Seoul: Yuhi by Yi Yangji)". Niigata University of International and Information Studies. Sŏul Taehakkyo. Sŏul Taehakkyo 40-yŏnsa, 1946-1986. "서울대학교 40년사" [Seoul]: Sŏul Taehakkyo 40-yŏnsa Pʻyŏnchʻan Wiwŏnhoe, 1986. Wohn Y. "Research misconduct. Seoul National University dismisses Hwang." Science 311(5768) (2006):1695. History of "Seoul National University"
This page was last modified on 7 September 2015, at 20:46.